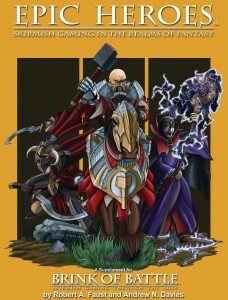 Brink of Battle's fantasy supplement is now available online. Go download yourself a copy. The Fantasy supplement to Brink of Battle: Skirmish Gaming Through the Ages is now available as a pdf from Wargame Vault. Epic Heroes lets you add magic, monsters, fantasy races, flyer, and exotic beasts and cavalry to your games of Brink of Battle.